In a first on the African continent, Rebsons Labels has imported the Nilpeter Panorama Digital Printer to South African shores. Finding its new home at the Rebsons Labels headquarters in Selby, Johannesburg, this incredible digital printing machine is revolutionising printing for both label manufacturers and the print and packaging industry. So what can this printer do and how will it improve label printing? 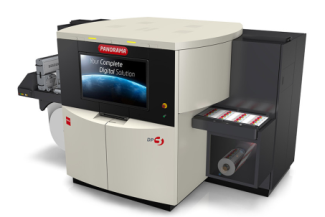 High print quality and image resolution – the limitations that can be found with flexo graphic plates in terms of image resolution are virtually non-existent with the Panorama digital printer. Colours are more vibrant, images are enhanced and the general quality of the printed label is much better. A higher quality label product for our customers. Fast and furious print – with press speeds of up to 50m/min the high production capacity of the Nilpeter Panorama allows for Rebsons Labels to print orders exceptionally quickly and reduce lead times considerably, saving our clients both time and money. Customised labelling – The Nilpeter Panorama has been designed to fit individual requirements for each client’s labelling specifications. The ease of use enables us to respond to any customer requests – printing the exact quantity required with no minimum, no waste, fast turnaround, and a low cost per label. Personalisation – in a world where consumers are looking for more personalised products (think of craft beer and personalised Coca-Cola cans) it can often be tricky to provide this personalisation due to time and cost restrictions. Rebsons Labels however is now able to offer personalised labels for products through the Nilpeter Panorama Digital Printer, allowing our customers to order the exact label quantities they need. Whether this is 1 or 100,000 adhesive labels. Not only can Rebsons Labels offer all of the above but extras such as foiling, lamination and delamination can also be produced quickly and cost effectively. To complement the press and add value to your labels Rebsons has teamed up the Nilpeter Panorama with ABG’s market leading digital finishing machine, the Digicon Series 3. Being both quick (running up to 64 metres per minute) and flexible, Rebsons Labels is able to offer a wide range of sophisticated finishes with this machine. Some of these include reverse printing and printing on the adhesive/liner, to cold foiling, super varnishing and lamination. This is a high precision finishing machine capable of producing impressive labels and packaging. It is suitable for a wide range of industry applications. Says Benny Friedman, owner of Rebsons Labels: “Rebsons Labels has always moved with the technological trends over the past years, upgrading and purchasing state-of-the-art label printing equipment. My first Nilpeter press changed my business. I printed self-adhesive labels that were far more sophisticated than before, launching my business into a whole different league”, Friedman explains. “All the presses I have bought over the years have been state-of-the-art, and the Nilpeter Panorama now adds to this.” says Friedman. At Rebsons Labels we’re excited to be able to offer our clients this state of the art technology and service, to ensure that they receive labels of the highest quality, in the quantities they need and in the time that they need them. Rebsons Labels will be hosting an Open Week from the 5th – 9th February 2018 so that clients can see a demonstration of the Nilpeter Panorama in action and understand how this will simplify, enhance and improve their label printing. Visit http://www.rebsons.co.za/digital-printing/ for more information.